Pigeon Species / Breeds "I" - "M"
Laurel Pigeon (Columba junoniae): Endemic to the Canary Islands. A rare resident breeder in the mountain laurel forest zone, it builds a stick nest in a tree. There it lays one white egg. At 40-43 cm, it looks like a very dark Wood Pigeon. It is a basically dark brown bird, with a dark pink breast. The lack of any white markings, together with its darker markings, distinguish it from the other species. Brown, rather than dark grey plumage, and the lack of dark bands on the grey tail distinguish it from the other pigeon endemic to the Canary Islands, Bolle's Pigeon. Its flight is quick and performed by regular beats. 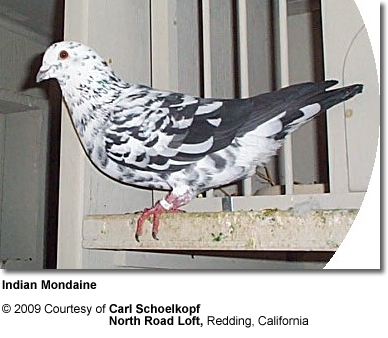 An occasional sharp flick of the wings is characteristic of pigeons in general. Often, the bird takes off with a loud clattering. The call is a hoarse hiccuped cooing.